Middleham /ˈmɪdləm, -dələm/ is a small market town and civil parish in the Richmondshire district of North Yorkshire, England. It lies in Wensleydale, in the Yorkshire Dales, on the north-facing side of the valley just above the junction of the River Ure and River Cover. There has been a settlement there since Roman times. It was recorded in the Domesday Book as "Medelai". The name means "middle ham or village". The first known settlement at Middleham was during the Roman Era. The IXth Legion of the Roman Army conquered York in 69 AD and moved north. A branch road from the Great North Road passed through Middleham to the Roman fort at Bainbridge. Near Middleham, the Romans built a guard station to control traffic on the River Ure. William's Hill is the remaining earthworks of the Motte-and-Bailey Castle Alan Rufus built. Before the Norman Conquest the lands in this area were controlled by Gilpatrick. In 1069, William the Conqueror granted the land around Middleham to his Breton double-second cousin Alan Rufus who built a wooden motte-and-bailey castle above the town. By the time of the Domesday Inquest in 1086, Alan had given this castle to his brother Ribald. Its earthworks are still visible at "William's Hill". Alan also built the castle at Richmond. The castle that currently dominates the town, Middleham Castle, was started in 1190. The Nevilles, Earls of Westmoreland, acquired it through marriage with a female descendant of Ribald in the 13th century. It was called the "Windsor of the North". The castle was in the possession of Richard Neville, 16th Earl of Warwick when his cousin Richard, Duke of Gloucester (the future Richard III ) came there to learn the skills of knighthood in 1462. During the Wars of the Roses, both Edward IV and Henry VI were held prisoner here. Richard, Duke of Gloucester became master of the castle in 1471 after Warwick's death at the Battle of Barnet. Richard used the castle as his political base as he administered the North for his brother Edward IV. Richard married Warwick's daughter, Anne Neville, in 1472. Middleham Castle is where their son Edward was born (c. 1473) and where he died in April 1484. Richard III died in August 1485 in the Battle of Bosworth. He was the last reigning King of England to die in battle. At the time of Richard III, Middleham was a bustling market town and important political centre . 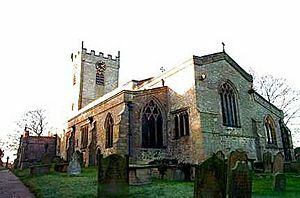 As early as 1389 the lord of Middleham Manor received a grant from the crown to hold a weekly market in the town and a yearly fair on the feast of St Alkelda the Virgin. The town is built around two marketplaces, the larger, lower market is dominated by a mediaeval cross which is topped by a modern iron cross in the Celtic style. The upper, or swine market, centres around the remains of a 15th-century market cross and a line of steps. At one end of the market cross is a worn effigy of an animal reclining and at the other there may have been a moulded capital. Most buildings in the old part of Middleham were built after 1600, though the old rectory has some mediaeval elements incorporated into it. In 1607 it is documented that Middleham was important enough to have a Royal Court, and all residents of the forest of Wensleydale fell under its jurisdiction. From the accession of Richard III until Charles I sold the manor to the City of London in about 1628, Middleham and surrounding lands were part of the Crown estates. In 1661 the City of London sold Middleham Manor to Thomas Wood of Littleton, and it has remained in private hands until today. In 1915 the yearly livestock market was one of the most important in the North, though the weekly market had fallen into disuse. Today the livestock market has moved to Leyburn. The Church of Saints Mary and Alkelda was founded in 1291 and consists mainly of 14th and 15th century architecture, although there are stones indicating the existence of a church on that site perhaps a century before. The only remaining Norman artefact is a section of zig-zag moulding that was once round a door or window, and now appears above the north aisle. The church has a three-metre-high Perpendicular font cover and a replica of the Middleham Jewel. West of the church is St Alkelda's well, whose waters are reputed to restore strength to weak eyes. In 1478 King Edward IV gave permission for a leper hospital to be built on the east side of town in association with the church. Today the location is still known as Chapel Fields, but it is given over to a horse-training stables of the same name, and no trace of the hospital or chapel remains. Today the town is a centre of horse racing and home to the Middleham Trainers' Association. The first racehorse trainer at Middleham was Isaac Cape in 1765. Today there are several racehorse trainers including Mark Johnston, Jedd O'Keefe, James Bethell, and Ben Haslam. Racing is the number one employer in the town and tourism is the second biggest. The castle is a ruin after having been dismantled in 1646. The keep, which was built by Robert Fitz Ralph in the 1170s, survives along with the 13th-century chapel and the 14th-century gatehouse. The front of the Middleham Jewel showing the Crucifixion of Jesus. In 1985 the Middleham Jewel was found on a bridle path near Middleham Castle by Paul Kingston and Ted Seaton using a metal detector. It has since been acquired by the Yorkshire Museum in York for £2.5 million. 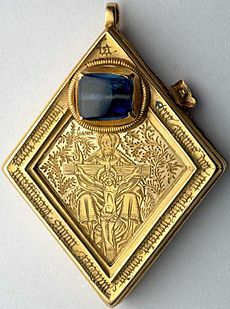 It is a late 15th-century 68 gram gold pendant with a 10-carat blue sapphire stone. The pendant is lozenge shaped, engraved on the obverse with a representation of the Trinity, bordered by an apotropaic Latin inscription (i. e. one that wards off evil) protecting the user from epilepsy. The reverse face is a highly decorative engraving of the Nativity, bordered by the faces of thirteen saints. The back panel slides to reveal a hollow interior, which originally contained three-and-a-half tiny discs of silk embroidered with gold thread. The textile contents identify the jewel as a reliquary, containing a fragment of holy cloth. It would have been worn by a lady of high social status, as the centrepiece for a large necklace. The sapphire may represent Heaven, and have acted as aid to prayer. The Middleham Hoard – three pots containing 5,099 silver coins in total – was buried during the English Civil War. It is the largest Civil War hoard ever discovered. A livery badge for pinning to the chest or a hat, in gilded copper high relief, with Richard III's emblem of a white boar, is very likely to have been worn by one of his household, when he was Duke of Gloucester. The Middleham ring (in the Yorkshire Museum) was found in 1990. It is a gold ring decorated with a low-relief inscription along the band, which reads SOVEREYNLY. A circular, copper-alloy plaque (3-inch (70 mm) diameter) bearing the initials "R" and "A" surrounded by the French motto A Vo. Plaisir (For your pleasure) may represent a casket mark given by Richard, Duke of Goucester to his wife Anne. The town lies between 400 and 500 feet (120 and 150 m) above ordinance datum, although the valley of the River Ure just below the town is only 325 feet (99 m) in elevation and the summit of the hill to the south-west of the town is 850 feet (260 m). The parish contains 2,155 acres (8.72 km2) of land. Most is permanent pasture – only about 150 acres (0.61 km2) are arable. The topsoil is of mixed composition. The valley has modern alluvial terraces and gravel deposits, but the subsoil is mainly limestone, although it is intersected here and there by sandstone with plate. There is a known vein of lead in the northern part of the parish. Braithwaite lead mine lies just outside the parish borders. 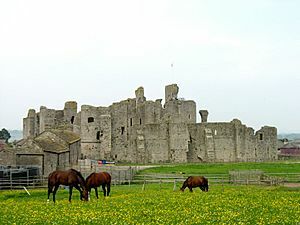 Middleham was featured three times in the British television series All Creatures Great and Small. In the episode "Against the Odds", the Manor House doubled as the home of the Barraclough family. In the episode "Where Sheep May Safely Graze", Middleham Antiques, in North Road, became Geoff Hatfield's confectionery shop. Ferndale became the home of the Darnley sisters in the episode "The Rough and the Smooth". Middleham Facts for Kids. Kiddle Encyclopedia.